The end of the year is a happy time for me. I take my winter break to spend time with my family and friends, who I see so little of during the busy work schedule. I also spend a great deal of time reflecting on the long year of tattooing in the books, and the year of projects to come. 2018 was a whirlwind! The shop was busy cranking out big work! We gained new crew members and it is exciting to hear the buzz of machines down the hall. It is inspiring working with Carl Hallowell and Matt Van Cura, two likeminded artists with intense focused style. Both Carl, and Matt work regularly on large scale body suit style tattooing. Last year was by far the best of my career. I am fortunate to have built the clientele needed to pursue what is in my mind, a true form of tattooing, a pure design that is created for the body. In the end it is a collaboration between client and artist. Essentially the end result is your inspiration and my creation, a custom suit made to fit. This past year, I have learned a lot. I would like to share some of the knowledge that I have gained, with you all. We are looking at nearly 5000 years of tattooing! Basically, humans have been tattooing since the dawn of civilization. Pre 1800, and before the invention of the electric tattoo machine, is what I would consider Ancient tattoo culture. 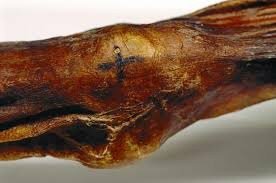 One example of the preserved tattoos on the ankle of Ötzi the iceman. The oldest discovery of tattooed skin was found on the mummified body of Ötzi, the iceman, dating between 3370 and 3100 BC. Records of tattooing in Mayan civilization, as old as 1800 BC, show tattooing amongst commoners and the noble class. Mayans believed the more skilled the design, the higher the status of the individual. Men were tattooed on their arms, legs, back, hands, and faces. Women preferred more delicate tattoos on their upper body. Not unlike today, in ancient times tattooing was practiced for spiritual, social, and artistic purposes. However, unlike our modern society in ancient times tattooing was viewed as sacred. Today there are very few people practicing sacred tattooing. Ta Moko – Maori face tattooing reserved for the chief of the tribe. 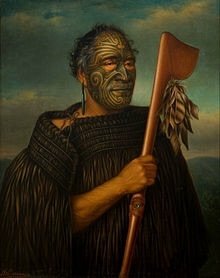 The Maori have a rich culture of tattoo dating back to 1300, when they first arrived on the Polynesian island of New Zealand in massive ocean bearing canoes. Tattooing in Maori culture is also regarded as a sacred art form. Designs can signify a great deal of information using abstract/geometric patterns. Amulets of strength and protection, family, social status, life journey, and coming of age are common subjects in the Maori tattoo. Moving north West of New Zealand we find another island civilization responsible for one of the most influential tattoo cultures of all time. Tattooing as we know it in Japan dates back to the early 1600s in the Edo period. 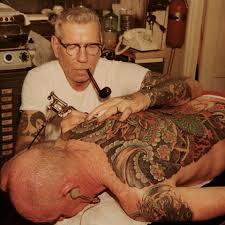 Although there are records of tattooing in Japan dating back to the Paleolithic period. Between 1600- 1868 tattooing along with all art forms in Japan saw a resurgence. Woodblock prints illustrated by Utagawa Kuniyoshi of the the 108 tattooed heroes of the Suikoden were made available to the public in the early 1800s. This sparked a tattoo craze in Japan that had been growing since the 17th century. Tattooing was popular amongst firemen, manual workers, the merchant class and artisans. Kuniyoshi himself was said to have a tattoo extending from his shoulders to his entire back. Ukio-e artists worked hand in hand with the tattooists of the time to design large scale body suit style tattoos. Here we see an example of one of Kuniyoshi’s tattooed heroes from the popular publication Suikoden. The Japanese bridge the gap between the ancient and classic tattoo eras. The Japanese take tattooing from an ancient tribal practice to the height of artistry in the Edo period. The Japanese body suit is the pinnacle of tattooing in the old world. There is evidence of tattooing in ancient European civilization, but it wasn’t until Japan opened its ports to the Western world in 1853, that sailors from America and Europe were introduced to the art of Japanese tattooing. Sailors and settlers had seen the art of Native American tattooing and Polynesian tattooing, and some had practiced the craft, but the Japanese tattoo by far was the most captivating. Many sailors would return home from there voyages with permanent souvenirs. This brings us into the Classic age of tattooing. In the mid 1800s, sailors learned the craft of hand tattooing and brought it home to Europe and America reintroducing the Western world to the tattoo. In the west the imagery changed from dragons and samurai to Eagles and pinup girls. With the invention of the electric tattoo machine by Samuel O’Rielly in 1891, the classic American tattoo revolution was ignited. Tattoos could now be applied with greater precision and efficiency than ever before. Early American back piece by Percy Waters. Another American Tattooer of the early 20th century of note is Percy Waters. He developed and patented a new tattoo machine design that has been the standard for the last 100 years. Waters had a successful world wide tattoo supply company, the first ever of its kind. By streamlining the distribution of supplies, knowledge of design, and application, he helped spread the ancient art of tattooing further throughout the West. Both American and Japanese artists make use of bold line work and black shading, but the American style is trademarked by a sort of jigsaw puzzle assembly of images and a predominantly open background. Each dominant design fills the appropriate space and there is very little overlap of imagery. In the 1930s and 40s tattooing picked up steam with sailors, marines, and carnies. 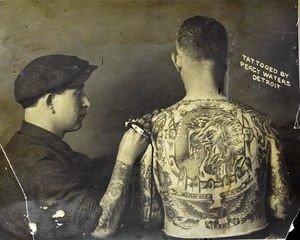 The military men got tattoos of exotic travel, like mermaids, dragons, and hula girls, as well as patriotic emblems of eagles, American flags, and military branch insignias. The tattooed sideshow performers were some of the first westerners to pursue full body tattoos. Fast forward to 1960s, during the Vietnam war, sailors and marines continued to get tattooed, but on the home-front the face of the nation was changing. There was civil and political unrest and the rise of the hippie and biker subculture in American youth. There was a new demographic of young wild kids getting tattooed. Sailor Jerry Collins working on one of the first ever Japanese style bodysuits applied by an American. Sailor Jerry Collins was the most prominent tattooer of the day. He was based out of Honolulu, Hawaii. Through his Navy clientele he was able to establish contact with other leading artists outside of the US such as prolific Japanese artist Kazuo Oguri known in the tattoo world as Horihide. Jerry envisioned a culmination of Japanese and American styles something that had never been done before. Jerry was a pioneer in the field and introduced the west to large scale Japanese tattooing. In the early 70s Jerry taught young tattooers Ed Hardy and Mike Malone styles and techniques that they would later use to once again revolutionize the art of tattooing. Tattooing in the West Coast exploded into a creative artistic expression on the skin. More innovation was introduced and by the 1980s modern tattooing was born. Styles, colors, and lifelike detail that had never before been seen in the flesh was now possible. But with this new detail and precision, there was something missing. Something was lost, the raw power, and purity of design were forgotten, and replaced with more and more detail. When I look forward to 2019 I am also looking back to the 1800s. As the world continues on further into the 21st century, moving closer to self driving cars and artificial intelligence, I am drawn back to the days of Kuniyoshi, Samuel O’Reilly, and Sailor Jerry. I am in search of True Tattooing, pure imagery, imagery that embellishes the body instead of disguising it.